If you’re a PC gamer, you’re probably always looking for ways to get your setup just right. You’ve got your key bindings just the way you like them and your chair is comfortable and ready for action. A mouse bungee can help you eliminate the drag from your mouse’s cable, leading to smoother movement and faster, more precise clicks. In this article, we’ve researched some of the best mouse bungees on the market so that you don’t have to and can spend your time dominating the leader boards. As you can see, we have a range of bungees in various sizes and weights, but let’s take a more comprehensive look at each of the products, starting with the Razer Mouse Bungee. Razer is a company that is widely known for high-quality gaming peripherals and software, and deservedly so. 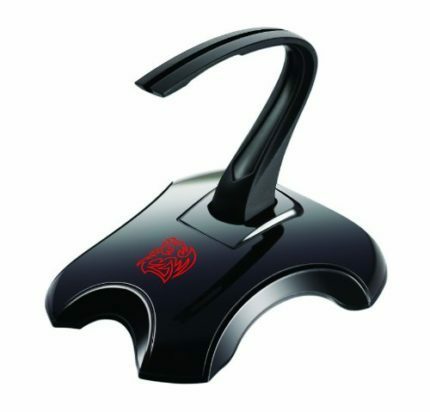 Their mouse bungee has an all-black, simplistic design which fits on just about any desktop. The base is weighted (despite the light overall weight of the product) and has four non-slip rubber feet to prevent quick mouse movements from toppling it over. It also has a sticky base, covered with a film initially that can be used if you find it not quite heavy enough for you. Razer has specifically designed this product to take up as little space as possible, and as it’s only 6cm wide, it won’t be the centerpiece of your workspace and won’t take up too much valuable desk real estate. Performance wise, the Razer mouse bungee does a great job of keeping your mouse cable elevated and reducing drag and tension, although the cable trough is relatively narrow and can’t comfortably hold a thicker cable, like the braided cables commonly found in high-end gaming mice. This is a shame, since traditionally Razer cater to their audience of well-equipped gamers, but not with this product. Overall, this product does exactly what it says it does. It keeps your cable tethered and provides a choice of weight based or adhesive based stability. It’s very compact and unobtrusive and considering the low cost, what do you have to lose? If you’re looking for something to enhance the look of your desk, this is the mouse bungee for you. Its futuristic design slightly resembles a teleporter and will look at home at any serious PC gaming station. 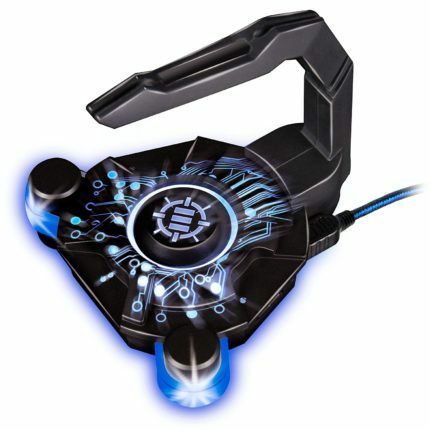 The Enhance mouse bungee comes with either blue or red LED lights so that you can perfectly match your area’s color scheme. It also has 4 USB ports (although if you want the lights to be on, you’ll need to sacrifice a USB port on your computer), which we found was very useful, especially if you have a lot of peripherals plugged in at the same time. This bungee, unlike Razer’s version, is capable of handling a thicker, braided mouse cord, but lacks the slim profile, being both wider and deeper. It’s still not huge, but its footprint is definitely larger overall. It’s also twice as heavy as the Razer model, and rightly so since it lacks the adhesive stability option and relies solely on its weight and its three non-slip feet to remain in place. We found that for the most part, it remained solid, although frantic movements did shift it ever so slightly. Additionally, whilst good for charging devices, the USB ports can’t be used to read flash drives and can sometimes lack the power for four different peripherals at once, although this obviously depends on the power requirements of whatever you plug in. Charging a phone, using a mouse and keyboard and using a dongle is fine, plugging in four phones is not. All things considered, we really like this bungee. It performs as expected and it looks great. The choice of LED colors and the USB ports are additional bonuses on top of a well-performing cable management tool. We wish it were slightly heavier, but you can always weight it down a bit more yourself if you find it too light. The MECO Mouse Bungee is available for under $10, which definitely makes it the least expensive bungee on this list, but how does it hold up? Well, firstly, it’s relatively heavy. It weighs 0.34 pounds, placing it between the Razer and Enhance bungees in terms of sheer weight stability, but it also has adhesive pads on the bottom to give it that little extra staying power. We found that the quality of the adhesive pads highly variable, although it does a decent job at remaining in place even without them. This is the only bungee we’ve found that actually works better on a thicker cord than on a thinner one. We found that standard thin cords had a tendency to slip out from time to time, whereas our braided cord gaming mouse remained tight even with erratic movements. If you have a thin corded mouse and you really want a bungee on a budget, you could hypothetically make this one work by wrapping a section of your cable in tape, but realistically we’d have preferred some sort of adjustable grip width. The design of this bungee is ultra simplistic. It’s just metal and plastic, although you do have a choice of six different colours, which is a bonus not often found on ultra low-cost peripherals. Overall, this bungee is a good choice for someone who’s interested in trying a mouse bungee but isn’t sure whether they can justify paying more money for one. It does the job it’s supposed to, but struggles when it comes to standard mouse cords, preferring the thicker style more often found on gaming mice. There’s a running theme with the mouse bungees above: they either work for a thin cable or a thick cable, but not both. In comes Thermaltake’s offering, the tT eSPorts Galeru. It consists of two parts: the base and the arm which are connected by a magnet to ensure that the arm never wiggles in place, which could contribute to slack in the cable. 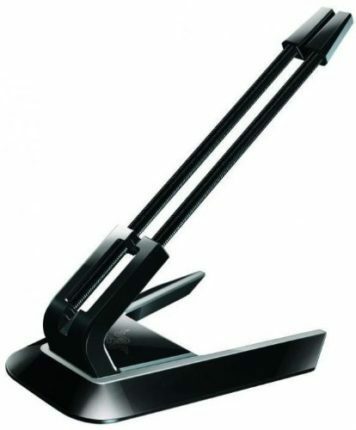 The arm is scorpion tail shaped, which prevents the common problem of the mouse cable dragging against the base of the bungee. This is the heaviest bungee we’ve reviewed, weighing in at one pound. 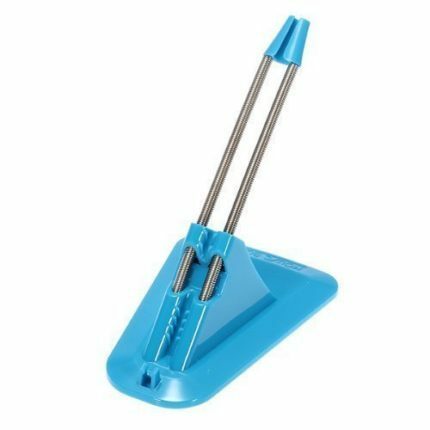 Combined with the non-slip feet on the base, this ensures that the bungee itself does not move except for when you’re deliberately trying to make it move. The design is sleek and simple. The bungee itself is quite small which ensures that it won’t get in the way or take up too much room on your desk, and the colour scheme will fit in nicely with most setups. We’re divided on the inclusion of the red logo. Some people may prefer it, but some of us would rather it were a more muted colour so as to be less distracting. As mentioned above, this bungee holds thin and thick cables snugly and we never encountered a time when either type came loose or slackened. This is a product has one job and does it very well. The only disadvantage we can find with this is that it’s quite pricey, and more than double the cost of some of the other bungees in this list. For the extra money, we’d have liked to see some USB ports or even an adhesive option, since it doesn’t cost much to increase the weight of something. This is a great mouse bungee which does everything you’d expect from it. There has clearly been a lot of thought put in during the design process, and the scorpion arm provides a real advantage that other bungees just don’t have. If you don’t mind the increased cost, this will be a great product for you. Mouse bungees by design are quite simple, so there isn’t very much you need to know before buying one, but there are a few things to look out for, since they may bear some relevance to your particular setup. A mouse bungee is basically a mouse cable anchor. It must remain stable with minimal movement whilst you’re using the mouse. There are two ways they do this: by being heavy enough or by sticking to the desktop. More inexpensive models will usually have a sticky base and these will suit most people’s needs, although we can’t recommend them if you have a papered desktop or an expensive wooden desk. Heavier models tend to be more expensive, but still not prohibitive in terms of cost. The benefit of these is obvious: they won’t leave a mark or residue on a desk. Mouse bungees work by reducing drag and friction created by the mouse cable rubbing on the desktop. It’s important to note that if you’re spending money on a mouse bungee, you’ll need to make sure you take other actions to help minimize drag from other sources too. This means you’ll need a mouse mat of some kind, and ideally, you’d use a laser mouse instead of a ball one since these are more precise as well as more hygienic. Well, there you have it. We’ve reviewed and compared some of the best mouse bungees on the market and highlighted the strengths and weaknesses of each. Despite all of our recommendations being great products, our favorite was the Thermaltake tT eSports Galeru. Despite being a bit more expensive, it outperforms every other bungee we tested in terms of usability and versatility. It’s a strong performer and well worth the money. We hope that our article has been helped you come to a decision as to which mouse bungee is the best one for you, and we look forward to seeing you the next time you need product advice. Buy with confidence and good luck.